Happy winner of 50/50 raffle, Ken Clarke, VE7BC with prize of $148.50 cash, 50 percent of proceeds from sale of raffle tickets during event (BC Gaming Licence #104561). Winning ticket number is 877201. Ken runs the QSL Bureau at local Amateur radio events. 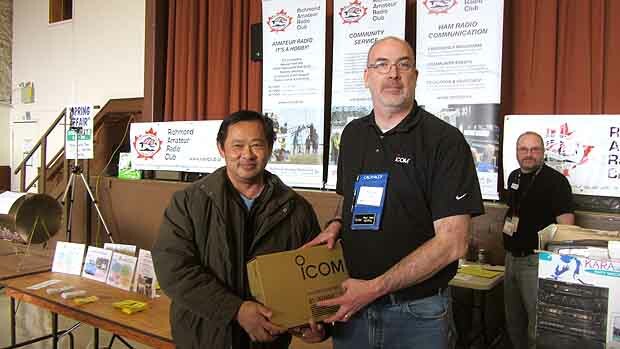 Proud winner of grand door prize, Larry Lee, receiving Icom ID-4100A D-STAR Mobile Duo-Band transceiver presented by Paul Veel, Amateur Sale Manager of Icom Canada. 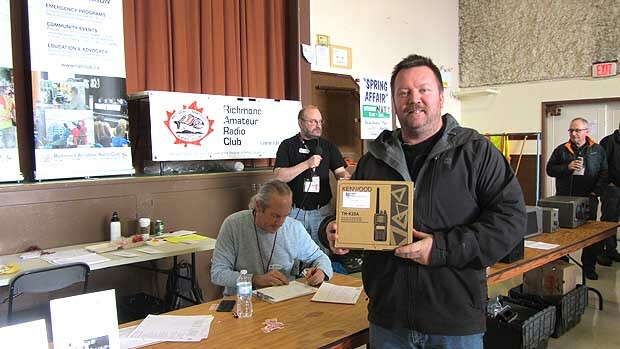 Another well-anticipated door prize, a Kenwood TH-K20A provided by Burnaby Radio Communication, won by Chris Cowx, VA7KWX. 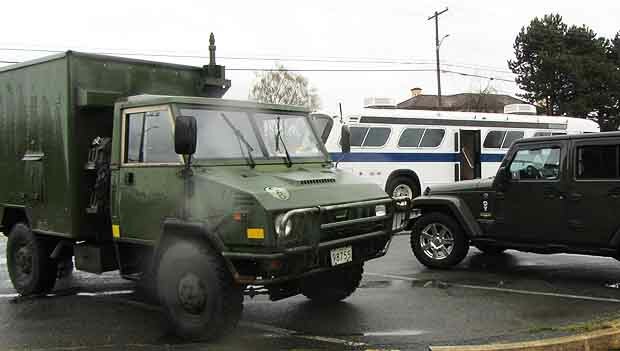 Not only does one often see VECTOR's Community Emergency Response Vehicle (CERV) out in Richmond but to have it displayed in the same parking lot as Surrey's SEPAR trailer (out of photo to the right) and a radio command vehicle (VM90) from the Canadian Armerd Forces, 39 Service Battalion is a rare sight indeed. Too bad that Richmond Emergency Programs communications vehicle and The Salvation Army Community Response Unit van were not able to make it for this year's event. 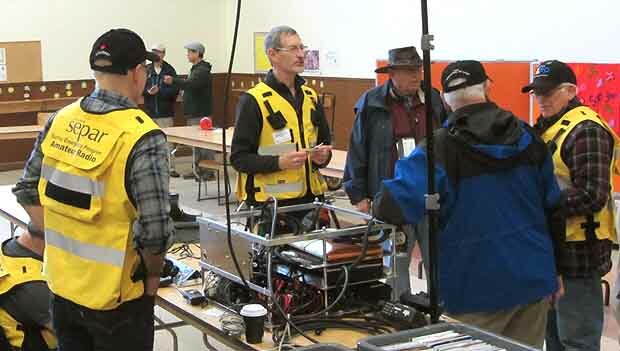 RARC sees value in promoting awareness of Amateur radio's role in emergency communications and the successful outome of the past two annual events justify plans to grow this segment of the annual event for next year. Happy winner, happy ham radio operator, happy father. Chirs Lowe,VA7XZZ, a VECTOR member who frequents such Amateur radio events, is one of many door prize winners on that morning. RARC plans to grow the event to include children and family and involve the community. Aren't children our future, as well as the future of Amateur radio? The RARC Swap Meet on Apr. 7, 2018 presents marketing opportunities for vendors of Amateur radio and related computer and electronics products and services to the Amateur radio community in the Greater Vancovuer area. 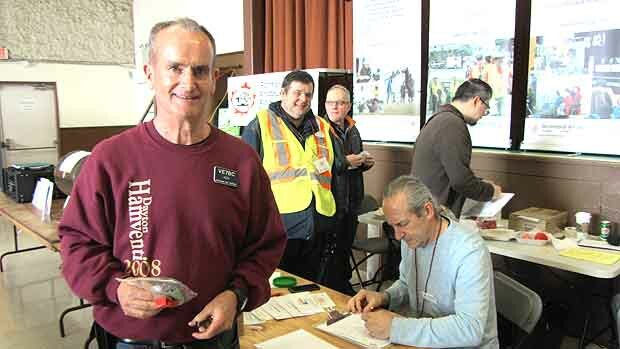 This event takes place in the Vancouver and Richmond part of the Lower Mainland, drawing attendees from a new market segment along with regular Amateur radio enthusiasts from the Lower Mainland and Fraser Valley. 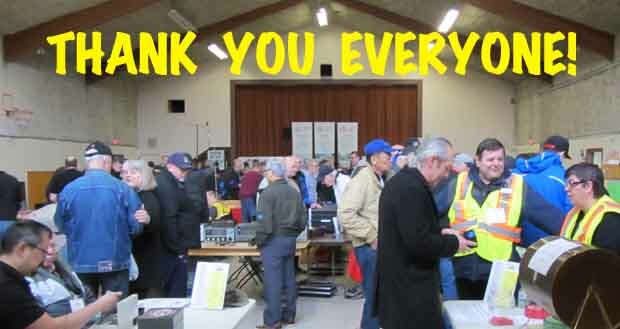 RARC welcomes support from corporate vendors through donations of Amateur radio related items (to be raffed as door prizes at the event) in exchange for advertising and publicity benefits. E-mails - Messaging with planned follow-up content are sent to identified groups in the community that may be target markets for the event. These groups include local Amateur radio organizations, groups that are related to the electronics hobby, groups that have potential interests in Amateur radio, and businesses that may be interested in products at the sawp meet. Posters - Printed posters will be distributed at locations that are frequented by a broad section of the community (e.g. local community centres, coffee shops, business with community activities bulleting boards). Posters will also be posted at venues where there will be high-traffic events (i.e. Christmas craft fairs, community concerts, etc.). Posters will be periodically updated with new donors and advertisers on the list. 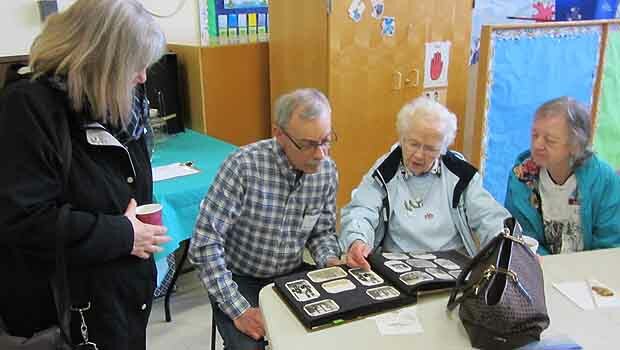 Web Site presence - Updates on the event and related Amateur radio information will be posted on the RARC Website (www.rarclub.ca) and event Website (www.richmondarc.ca) to generate frequent visits to the page and cultivate conversation about upcoming events. CONSIDER THE MARKETING OPPORTUNITIES FOR YOUR COMPANY BY BEING ON RARC'S PROMOTION PROGRAM FOR THE SWAP MEET.